* The trend today for Nordic cuisine is a whole different: less shorter and chubby to the salad table. 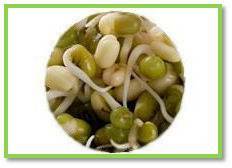 Mung beans are a staple in Asian cuisine; About 80% of the crops go to cooking, while only about 20% go to germination. So what we are looking for as mung beans is the small part of the world’s seeds. Plant breeding is highly focused on resistance and yield, germination seems to be overlooked! Have you seen the term “böngroddar” is the same as mungbønnsgroddar here in the Nordic region. Japan appears to be one of the world’s largest customers of mung beans; There are data that they buy about 50 million kg of seed per year for germination. Have you seen well-polished, almost shining, reflective mung beans, you’ve just seen polished mung beans. Beautiful and enticing but totally wrong for grodding! When polishing, the seeds are damaged and are infected with sponges and bacteria. These mung beans are often cheaper than those unlearned! Are you a growler: We are constantly looking for different options and can find the quality (quality / price) that you are looking for. Want to be fuller or shorter, smaller or longer, easily scaled or does the price play a crucial role? Agortus finds the quality that you are looking for.